Seeing a comic book character come to life on a screen is very exciting! But when it's a female who fights evil and always wins, there is a certain charm and allure that captures audiences around the world! The plot is always pure and simple and contains enough action packed adventures to interest even the smallest of viewers. Wonder Woman herself believes in what she is doing and her passion for helping and saving gives every story a unique feel to which the viewer can relate. Armed with strength, agility and weaponry that includes a magic belt, bracelets that can stop bullets, a tiara that is used as a throwing weapon, and the magic lasso that forces the enemy to tell only the truth, Wonder Woman navigates her way through the mire of human life. She has superhuman strength, can fly, and has outstanding combat skills and war tactics. Wonder Woman comes from Paradise Island, where other females had fled many years ago to escape male persecution. While on this island, the women found a substance called Feminum that provided them with superhuman strength and made their weapons magical. During WW II, Major Steve Trevor of the U.S.Army crash lands on the island. Wonder Woman rescues him, secretly falls in love with Steve and under the name of Diana Prince, joins the U.S. Army Air Corps as a yeoman and returns to America as his secretary. She wears glasses and dresses like other females which prevents Steve from knowing that Diana and Wonder Woman are one in the same. Under this guise, she keeps her powers hidden until the need arises for super protection whereupon Diana emerges from a tremendous whirl as Wonder Woman! She not only stops the criminals in their tracks but she also turns them into productive humans. This classic series offers the viewer goodhearted superhero action and the prevailing theme that good will win over evil. The language, behavior, and plots of the episodes are suitable for family viewing. With her examples of self-reliance, respect for human life, and her dislike of violence and aggression, Wonder Woman is an excellent role model. The leader of a spy ring must deal with a phantom-like man and Wonder Woman before he can locate his headquarters in an old amusement park. Part one of a two-part episode. A young woman with destructive psychokinetic powers unknowingly helps a thieve steal some priceless historical documents. Diana uses a computer dating service to investigate a stolen vial containing a deadly virus. Wonder Woman stops the black market sale of a super-secret missile guidance systems scrambling device and thus avoids an international incident. Diana Prince goes undercover as a popular singer to crack a record extortion ring. Wonder Woman must recover a set of powerful crystals stolen by a cunning cat burglar, who is using a science fiction convention to cover his tracks. Diana tries to prevent a scientist from selling an atomic bomb on the black market. Diana looks to recover a set of printing plates capable of producing high quality counterfeit currency. She is aided by a strange Irish cobbler, who may be one of the legendary leprechauns. Wonder Woman uncovers a plot to steal millions of dollars in jewels from wealthy party-goers by impersonating her and her colleagues. A land developer kidnaps a trained dolphin and uses it to sink an oil tanker which will lower beachfront property values. A ruthless mobster wants to turn the sleepy town of Santa Corona into gambling casinos and uses Diana Prince's teenage goddaughter, a skateboard champion, as his lever for blackmail. A woman travels from Earth's future to the present day with the idea of making herself rich using her knowledge of what is to come. A man from her era follows her to stop her potential interference and, with the aid of Wonder Woman, prevent a major disaster. A deadly pesticide threatens the human race and a strange ant woman threatens a billionaire industrialist as the IADC and Wonder Woman find themselves on both sides. A man lures important government officials into his disco so he can rob their minds. Music legend Wolfman Jack guest stars. Wonder Woman investigates a series of robberies that happen at museums and private homes that have amazingly lifelike statues. Can the heroine discover who is behind the crimes before its too late? A scientist has invented a drugged dart that causes an individual, once hit by the dart, to act in an irrational manner that is totally opposite to their normal demeanor. With a mob boss looking to use the dart for influencing the outcome of a footbal game, Wonder Woman must save the scientist from his clutches and stop his plan. Diana helps the police find a car theft ring and a Rolls Royce with a valuable microchip hidden in its hood ornament. A teenage pop music star is kidnapped on the eve of a huge arena concert and is replaced by his twin brother. Wonder Woman (LYNDA CARTER) saves the world from an angry scientist and a "thinking" missile. A janitor is pursued by his employer and a rival company after discovering the key ingredient for a new explosive formula. Phillip Michael Thomas ("Miami Vice") guest stars. 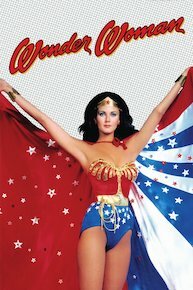 Wonder Woman (LYNDA CARTER) catches phony psychics and rescues three members of a peace conference. Wonder Woman (LYNDA CARTER) is pitted against a former Army Colonel who has become an enemy agent and wants to destroy a new Air Force test plane. An evil mastermind is looking to obtain the leading computers in the world and IRAC is apparently his next target. Wonder Woman must stop him before the crimnal can complete his planned theft. Wonder Woman captures a hit man who is a master of disguise and saves the life of a world-renowned industrialist and the IRAC computer. Oscar-winner George Chakiris guest stars. Wonder Woman saves the world from an oil crisis when she exposes a magician's method of changing lead into gold. Ed Begley Jr. guest stars. Several world class athletes are kidnapped by a deranged genius who wants to use them in the next Olympics to compete for his nonexistent country. Rick Springfield guest stars. Three scientists working on a top secret government project are being kidnapped and replaced with robot duplicates. The only clue Wonder Woman has to solving the abductions is that all three liked to play with toys and had dealt with a local toymaker. Wonder Woman realizes that the fate of the world rests on her ability to save the great minds of America from evil alien forces from outer space. Someone has developed the world's most powerful laser - so powerful, it causes volcanoes wherever it strikes. His first blast raises a cone in the Peoples' Republic of China, who naturally sends agents to investigate. His next blast targets the Soviet Union, and they dispatch their own people. Meanwhile, the IADC sends their own agent Diana Prince. The agents must join forces to discover who controls the laser. But when they discover the mastermind's surprising motive for creating volcanoes, they must decide whether stopping him is the right choice. Master thief Evan Robley has his eye on the crown jewels of a tiny country - and if he steals them, Queen Kathryn will have to abdicate. This emergency draws IADC agents Trevor and Prince to the Agency at a terrible hour, and then undercover to ferret out the thief. Trevor's attempt to lure Robley off the grounds so he might be arrested fails spectacularly. Finally, Wonder Woman persuades the Queen to accept help, and together they discover - that the jewels are already missing! Wonder Woman finds Robley easily enough, but even caught by her lasso he denies stealing the jewels. Wonder Woman must discover the truth before Queen Kathryn's reign ends and her tiny country falls into unfriendly hands. Wonder Woman must use all her strength and power to stop a terrorist group from kidnapping Steve and other government officials. Wonder Woman investigates the disappearance of an intelligence plane over the Bermuda Triangle area and secures the safety of Paradise Island. Wonder Woman faces an unusual opponent: a Japanese man with telekenetic powers who seeks revenge against the heroine for a personal tragedy suffered during World War II. Wonder Woman journeys to South America to look into the rumored base of a group of Nazis supposedly working on resurrecting one of the most infamous men in history - Hitler! Wonder Woman ventures forth from Paradise Island to fight evil in man's world once again. In this episode, the heroine takes on an evil mastermind who plans to use a powerful robot against her. The never-produced 60s series was campy and awful. When a network passes on a pilot, we're often left wondering what it was like and why the network passed. But when a pilot has as much buzz as the "Wonder Woman" one did, there's a good chance it's not going to go away entirely. Three leaked scenes from the "Wonder Woman" pilot sort of explain why NBC passed on it. Watch them here. PHOTO: Adrianne Palicki as Wonder Woman...in the Classic Shorts! The Wonder Woman pilot is dead. You might not have cared before, but maybe seeing a picture of Adrianne Palicki wearing the classic costume with revealing hotpants will change your mind. Click through for the full image! 'Wonder Woman' Pilot Rejected: Will a Superhero Show Ever Stick? Put your golden lassos away, people. The much-anticipated "Wonder Woman" pilot in development for NBC has been rejected by the network, so it looks like we won't be seeing Adrianne Palicki as the Amazon Princess on TV anytime soon. The show had a promising cast (Palicki, Cary Elwes, Elizabeth Hurley) and has some buzz out of the gate. Apparently the network screening for the show went poorly, though, and the show lost some buzz as time went on. Phew! That was close. A while back we saw promo photos of Adrianne Palicki in her Wonder Woman costume for the new NBC pilot, and boy was it a disaster. You can see it pictured at left: shiny, cheap-looking fabric, blue boots, no stars...fans were in an uproar. Luckily, sometimes when fans get in an uproar they end up getting their way. Two new set photos from the show have been released, and the new, improved Wonder Woman costume looks much, much better. Superhero News: Fan Tweaks Colors of Awful 'Wonder Woman' Costume: Is It an Improvement? Yesterday we were treated to the first image of "Wonder Woman" star Adrianne Palicki in her costume. Opinions differed widely on internet forums as to whether the new costume is any good. Personally, I like the addition of the pants and the removal of the stars, it makes the costume a bit more practical. However, the fact that the costume is shiny pleather head to toe and that the boots have been turned blue bother me. First Look at Adrianne Palicki in Wonder Woman Costume! I'll admit - when they first announced the new "Wonder Woman" TV series, I didn't think it would get off the ground. Superhero TV shows go into development constantly, and almost none of them ever make it out of that alive. Couple that with the difficulty they've had making a big-screen version of the character, which has been at some stage of development pretty much forever, and it seemed like a recipe for disaster. Just last week, we learned that "Friday Night Lights" star Adrianne Palicki will be playing Wonder Woman in the upcoming NBC pilot. Well, the star-spangled heroine now has a villainess: Elizabeth Hurley. Earlier today, Hurley (who is known to most as the leading lady in the first "Austin Powers" movie or as the devil in the Brendan Fraser comedy "Bedazzled") tweeted that she is "Thrilled to be doing the NBC pilot Wonder Woman. Wonder Woman is currently available to watch and stream on CBS. You can also buy, rent Wonder Woman on demand at Amazon, Vudu, DC Universe, FandangoNow, Google Play, iTunes online.